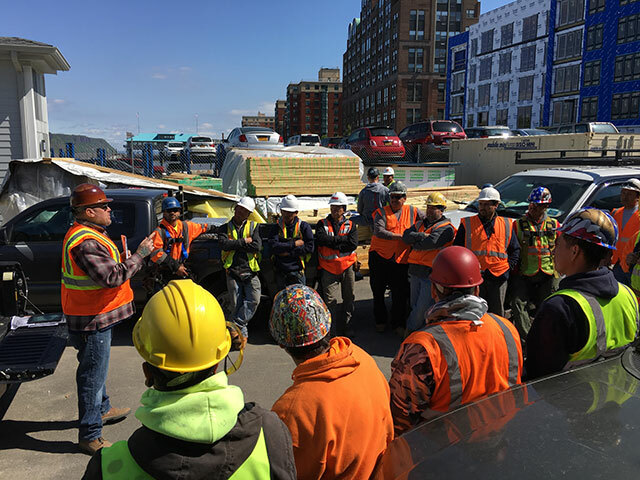 Since its founding, one of the goals of the National Framers Council (NFC) has been to provide a thorough, consistent, third-party safety program in Spanish and English for professional framers and their subcontractors (subs). NFC President Ken Shifflett of Ace Carpentry in Manassas, Virginia recalls, “This [subject] goes back to some of the initial meetings before the NFC really got [started].” These initial meetings involved larger framing contractors brainstorming ways to solve their common problem: their subcontracting labor had limited access to a quality safety program. Ken says that while larger framing companies often have a safety program of their own, the subs they work with do not “have the money, time, or know where to go to really get a safety program that is specific to the framing industry.” In addition, it creates liability issues for larger companies to provide their own safety program to subs and require them to follow it. “If we take Ace Carpentry’s safety program and submit it to a [general contractor] and say, ‘This is our safety program,’ the [general contractor] is expecting everybody on that job under Ace Carpentry’s control to follow that safety program,” says Ken. As a result, a citation given to a sub for a safety violation can mean a citation for the jobsite framing contractor as well. FrameSAFE has taken hold with subs throughout the country for “multiple different reasons,” says Ken, and numerous NFC initiatives have been put in place to make it easier than ever for subs to gain access. Some larger framing companies, seeing the value of FrameSAFE, have either taken it upon themselves to promote FrameSAFE to their subs or have worked with NFC to provide incentives for their subs to join. This is similar to the approach taken by COO Frank Mudd of Southernwood LLC in La Plata, Maryland in collaboration with NFC. Frank invited Scott Stevens, NFC vice president, to give a presentation about NFC membership and FrameSAFE to his subs. Those who attended the presentation (which was also translated into Spanish) were offered free NFC membership, and Frank offered to purchase each new member a FrameSAFE subscription, allowing them to pay him back over time with a check deduction plan. At the end of the presentation, 14 of the 18 subs in attendance joined NFC and became FrameSAFE subscribers. NFC is glad to see one of its early goals coming to fruition – a goal that promotes the safety of America’s professional framing workforce – and appreciates the efforts that members have taken to turn that goal into a reality. Following the example of the NFC members above, others willing to promote FrameSAFE to their subs can help bring this goal to an even greater level of accomplishment.